I guess I tend to get obsessive about things, especially when I'm running away from emotional pain. I find something that will put me SO in the moment that I don't think about what hurts. Now, I am totally fixated on the birds returning to Long Island. Spring is very slow in coming this year. I'm not seeing much in terms of new growth and the weather has (for the most part) been dismal. But each day I'm seeing more (and a wider variety) of birds, if I just go looking. It puts me in the moment, so that's where I've been. I've mentioned the osprey nest. I cannot stay away. I was out watching them yesterday and noticed that they were very reluctant to leave the nest unattended. There must be eggs up there, and I want to be there when chicks eventually peek over the side. I can't imagine how they fledge....it's a LONG way down. It's something I don't want to miss. Yesterday, I was sitting and watching when I realized I was hearing a very unusual sound. It was like moving air with a soft whistle. The whistle was multi-pitched, like a chord and the chord would rise and fall slowly and very rhythmically. It's really almost impossible to describe, but it was a beautiful sound. 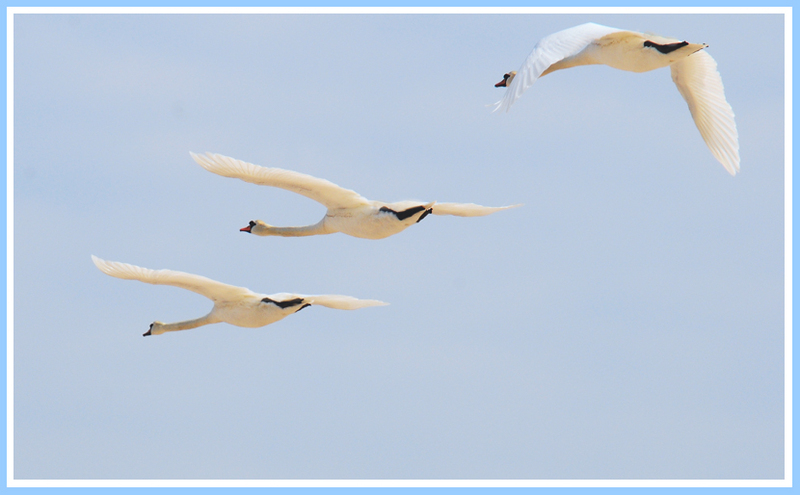 As I became conscious of it, it made me think of the sound I'd heard when I'd heard a swan fly overhead. I've never lived in a place where swans were indigenous. Until I lived on LI, swans were like decoration to me. You'd see one or two that had been purchased to adorn the retention pond at a high end condo complex. Certainly their wings were clipped and they weren't flying anywhere. Out here, we see swans regularly, usually a pair occupies a particular body of water. But this year, there are a multitude of swans everywhere. I'd noticed a huge flock of swans on the river that feeds into the sound right where I watch the ospreys. I counted, there were 30 of them. They're so territorial (and aggressive) that I was more than surprised at the number of them in one spot. Back to the point. I heard the sound and I thought I recognized it as the sound of a swan overhead. I turned around, and there were SEVEN swans just about to fly right past me! They are HUGE...it's amazing to think of them getting off the ground. It has to take amazing power to keep them airborne. And the flapping of the wings was the source of that soft and beautiful whistling chord. There was no way to get them all in a single frame, but I managed to capture three. Beautiful Kat! Sounds like your nature therapy is working. Hugs! I had the rare experience of watching a swan in the lake at Prospect Park in Brooklyn giving himself a bath. He flapped his wings vigorously to creat a shower, then pecked through his feathers. He must have done it almost 10 times. Each time it was a huge display of swandom. wow, you are finding just the right places to hang out lately! they are amazing. i hope you're finding your peace when you are out with your camera and your birds. Oh my...how exciting! I've been in a similar mood with escaping with photography. I never knew there were swans in your area. They are much more beautiful than the geese that annually invade my neck of the woods. Despite all the gloom that plagues my life, my spirits never fail to be lifted by the rebirth of spring! Keep watching those birds.......!